With the boat based at Port Ellen on Islay we are well situated to take advantage of the sea routes to many of the neighbouring islands. We can arrange trips or transport to the east or west coasts of the neighbouring isle of Jura as well as to the north and the whirlpool at Corryvreckan. 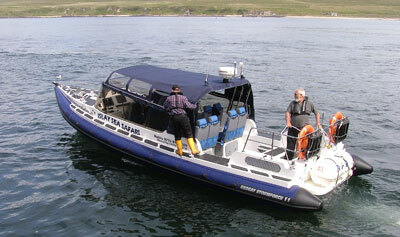 The islands of Colonsay, Mull, Tiree and Iona are all within easy reach via the Sound of Islay and it is possible to arrange a sea trip to any of these islands as well as provide a fast taxi service for any who require. To the east of Islay it is well within reach to visit Gigha and to cover the 30 miles south to Rathlin and Northern Ireland. Depending on sea and weather conditions we can also transport as far south as the Isle of Man or round the Mull of Kintyre to Arran. As a rough guide we charge between £25 and £per person per hour, though rates may be negotiable based on the trip in question.